A process that used to be guesswork is now a repeatable automated system that provides analytical insights in minutes, not days or weeks. Lnx Pharma, a division of Lnx Research, LLC announced today that its new and unique Media Leader Analysis (MLA) method, encompassing social network analytics, is the subject of a new article in BioMed Central’s open access Journal of Biomedical Semantics. 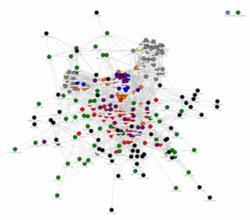 As simple as identifying friends on Facebook, the MLA method identifies which influential doctors and researchers have the greatest media presence in a specific disease area. Based on an extraction engine designed by Lnx Research, MLA begins by sifting through scientific literature and news articles to identify opinion leaders and media experts with precision and accuracy. A process that was normally highly subjective is now a repeatable automated system that provides analytical insights in minutes, not days or weeks. The new method replaces more biased methods of finding experts, and cuts short the time involved in manual online searching, thus saving time, money and corporate resources. Costs and accuracy are key factors for pharmaceutical companies and public health programs, which rely on key opinion leaders to synthesize research for internal and external stakeholders, including the general public. The Lnx team tested the MLA method using the topic ‘obesity.’ In less than an hour, this ‘find-an expert’ system generated a network of over 16,000 obesity experts with an accuracy of 90%. The results from this media search were then combined with data from the Lnx Scientific Collaboration Network, and social network analysis was used to generate a web of ranked experts, based on their combined scientific influence and media presence. This new method adds to Lnx Pharma’s already substantial expertise in identifying, ranking, mapping and profiling Key Opinion Leaders. In 2010, Lnx Pharma announced a unique method for ranking, segmenting and targeting thought leaders by their position in a network, which has gained rapid acceptance among medical affairs, scientific affairs, and marketing professionals in the life sciences. Located in Orange, California, Lnx Pharma is a division of Lnx Research, a privately owned company created in 2005 to apply social network analytics to problems in knowledge creation and dissemination. Lnx Pharma is passionate about providing the best solutions, to help pharmaceutical and biotechnology companies build confident KOL strategies that save time, money and provide great value while being fully compliant with regulations. Lnx Pharma provides an insightful, objective, highly reliable and accurate suite of products using social network analytics. Lnx Pharma’s Invisible College™ and Workcircle™ products include community mapping, center of excellence mapping, KOL identification, profiling services and more. Lnx Pharma is the leader in mapping scientific communities and the Lnx process is rapidly being adopted as Best Practice by global life science companies including Top 5 pharmaceutical manufacturers. To date Lnx Pharma has completed over 100 projects across 75 different disease areas.